Due to this environment, the children question very little. Even a child as intelligent as Norman — the said smartest in their class of what is later revealed as the best and brightest — isn’t shown as someone who wishes to fight against the system. 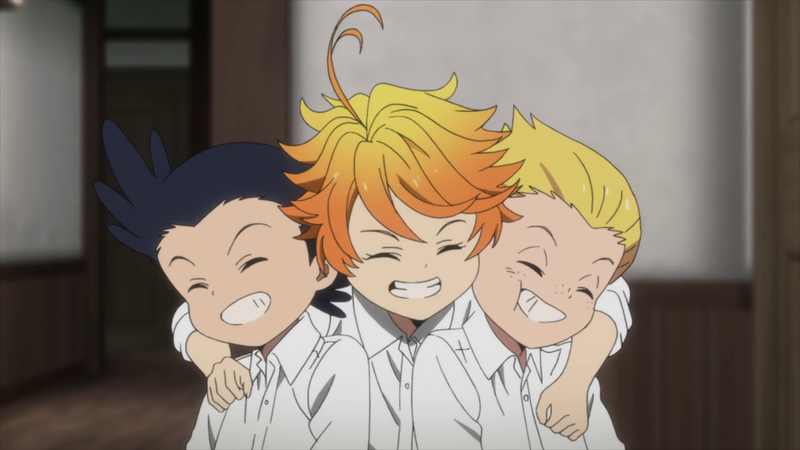 In the first scene of The Promised Neverland‘s premiere, the main trio of Emma, Norman, and Ray are shown slightly younger, looking past the gate. Emma repeats Mom’s words of caution. Ray says that they’re obviously a lie (a nod to just how much he knows at an early age). Norman simply wonders what the gate is protecting them from, almost as if he too suspects something is off about their setting, but doesn’t want to think badly of anyone. This is the power of Mom and the Grace Field House orphanage, which is raising these children as food for monsters. Grace Field House is essentially a luxury meat farm. The cushy environment that Emma, Norman, and Ray enjoy is in service of two things: to keep them happy and entertained so they won’t question their setting and to improve the quality of their meat by giving them a comfortable life until they’re slaughtered. We don’t yet know if all orphanages are like this. Some of them may be test-tube factories, especially if they’re not producing high quality meat for the rich like Grace Field House. 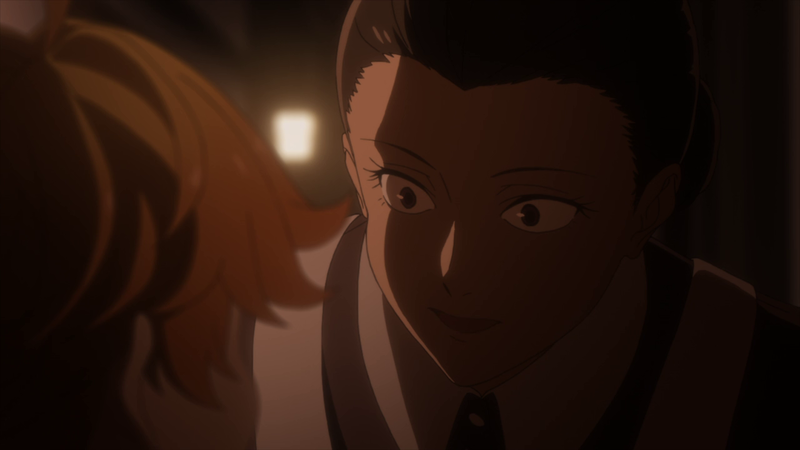 Yet as The Promised Neverland slowly pulls back the curtain with each passing episode, certain details are revealed that make the series’ dystopian setting as impressive as it is horrifying. 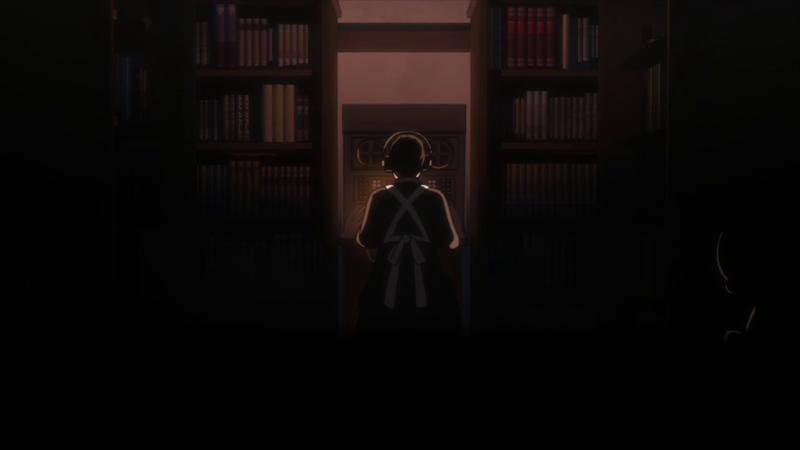 As the series slowly drops hints about its setting and the outside world, Mom (Isabella) becomes more of an interesting character. She is always framed from a distance or in an extreme closeup. 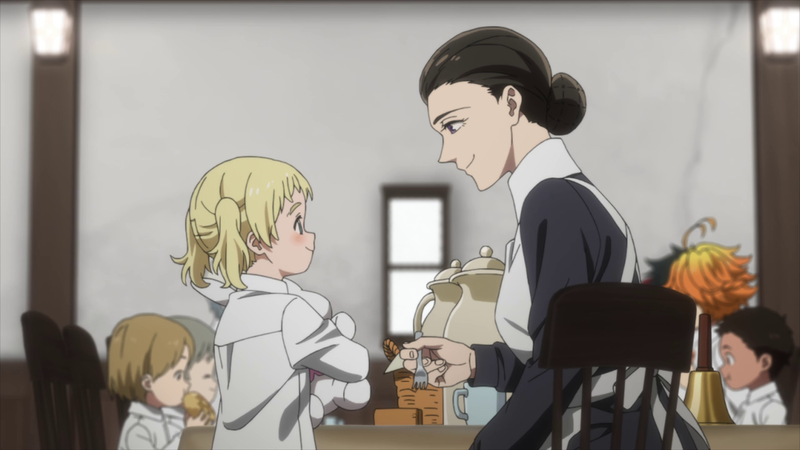 The latter is usually to convey her position of power over others — in conversations with Sister Krone, talking to Emma, revealing the stopwatch conspicuously to the group of children — and involves the camera moving in closer. The former paints her as in a similar situation to the children themselves. Like she, or someone, is always watching the children, Isabella is also watched in turn. This is often done with the camera moving further away from her, often as objects enter the frame in the foreground, obstructing our view. The camera’s distance is particularly noticeable when she reveals her own number at the end of a regularly-scheduled check-in (73584) before a superior presses her to say that her children are ready to be harvested at any time. It’s one of the few times that a close-up of her face is used to show a flicker of true emotion underneath her façade, and the reminder of her own place in the existing hierarchy. There are also times where it showcases her subtle actions from a distance. 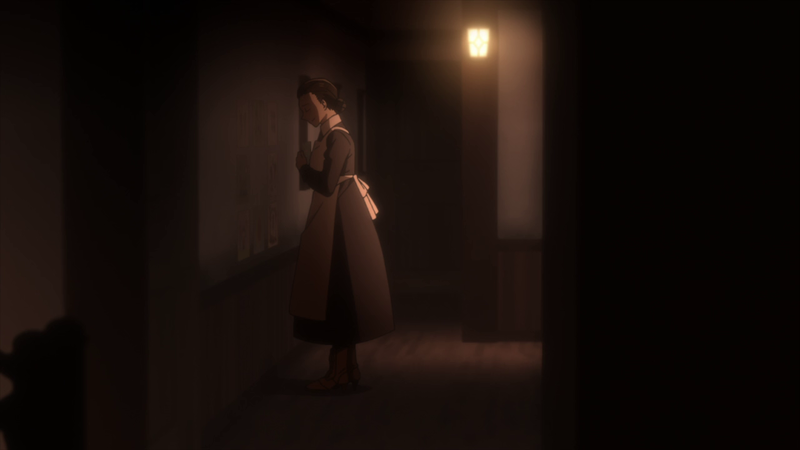 When Isabella intelligently removes Conny’s drawing from the wall, removing a reminder of Conny for the other children, she briefly holds it to her chest. Isabella is complicit in the system, but there are glimpses that make her appear human and sympathetic. 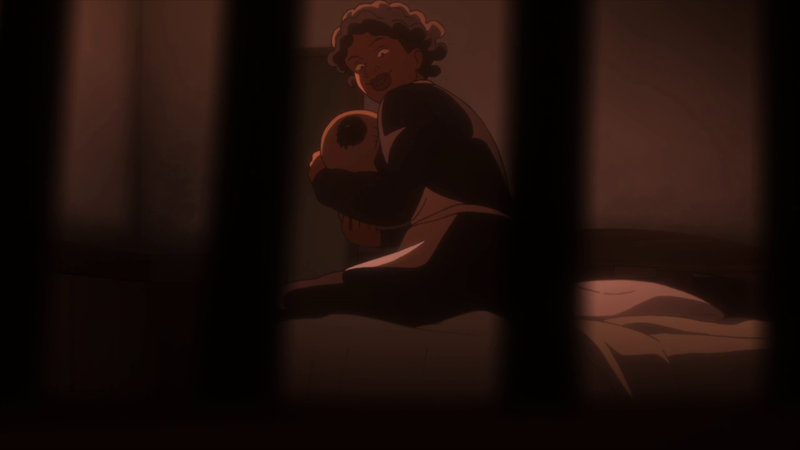 The Promised Neverland has recently moved to establish the same sympathy for Sister Krone, placing Krone trapped behind bars visually and showing her fear in the face of Isabella’s thinly-veiled threats. Due to his introduction as part of the main trio, Ray was already a sympathetic and relatable character. 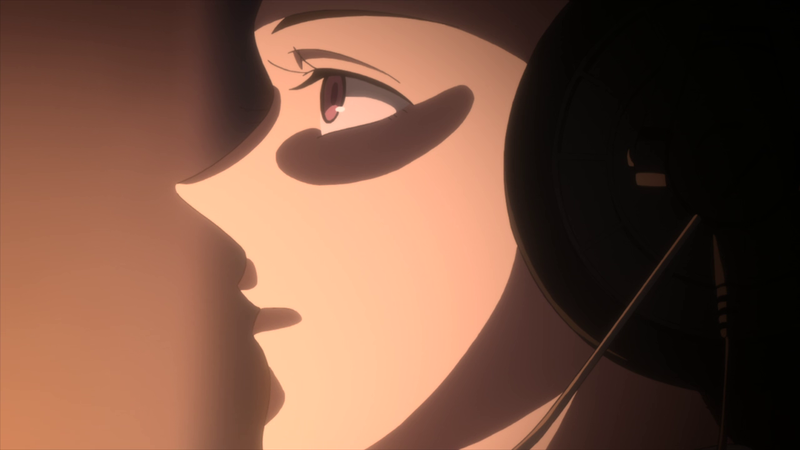 Despite having the most pessimistic outlook — likely due to his more informed viewpoint — Ray has also made it clear that he cares deeply about Norman and Emma, even as he tries to manipulate them in service of his own plans. He also, somewhat ironically, cares about being as honest as possible with others. It was Ray who was immediately angry at Norman about lying to Don and Gilda, giving them false hope. This is another hint that Ray is more caring than the dry-witted image he projects. I’m very curious about the world beyond the orphanage. Being in the orphanage we can speculate about the world but it will be interesting to find out where these kids actually are and what really surrounds them. The saddest moment would be if they get over the wall and realise they are just in another farm.